At this time of year you have to wait until quite late in the evening before it is dark enough to use a telescope. 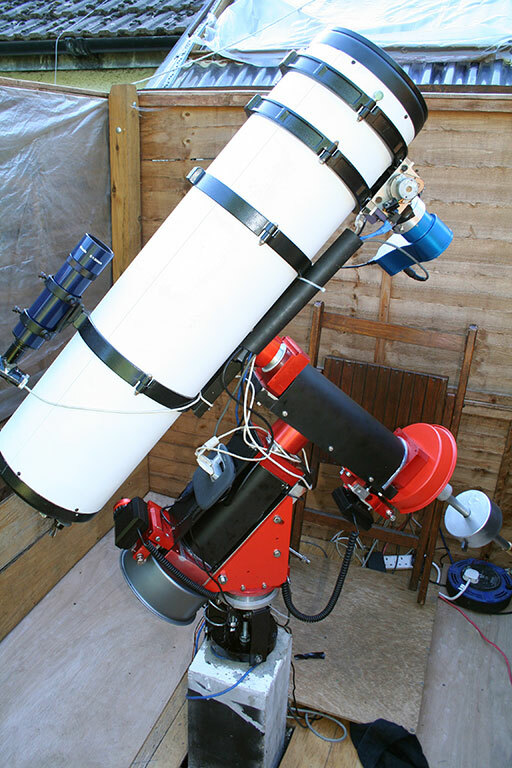 However, the long evenings can be used to refine the polar alignment of your telescope mount. Especially when you’ve just installed your new telescope mount in your observatory! So last night was telescope mount polar aligning night at the Curdridge Observatory. Whilst installing the telescope mount I had already got a rough polar alignment. Simply holding a finderscope flat against the RA shaft of the telescope mount and adjusting the mount so that Polaris is near the middle gets you to within a degree of the north celestial pole. Without a proper telescope mount polar scope we require a session of drift alignment to refine the polar alignment of the telescope mount until it is very good. Luckily I was a nice warm summer evening. I had a comfy chair in the observatory and good book to read. A webcam at prime focus and a copy of k3CCDtools on the laptop. K3ccdtools is the best program for doing drift alignment of your telescope mount because it will actually give you the rate (in arc seconds per minute) of the drift, thus you easily find out if you are adjusting the telescope mount in the correct direction. Prior to polar aligning the telescope mount I had to go through a few other telescope rituals. The Autostar needed calibrating and training. The off axis guider needed focusing. The finderscope needed aligning. The long evenings are sometimes useful when you are re-commissioning your telescope setup! By about midnight I had drift aligned the telescope mount to the point where drift was in the order of less than 1 arc second per minute – which is good enough for now. I am sure it could be better, but I had got very bored by now. So I had a pop at an easy bright target. 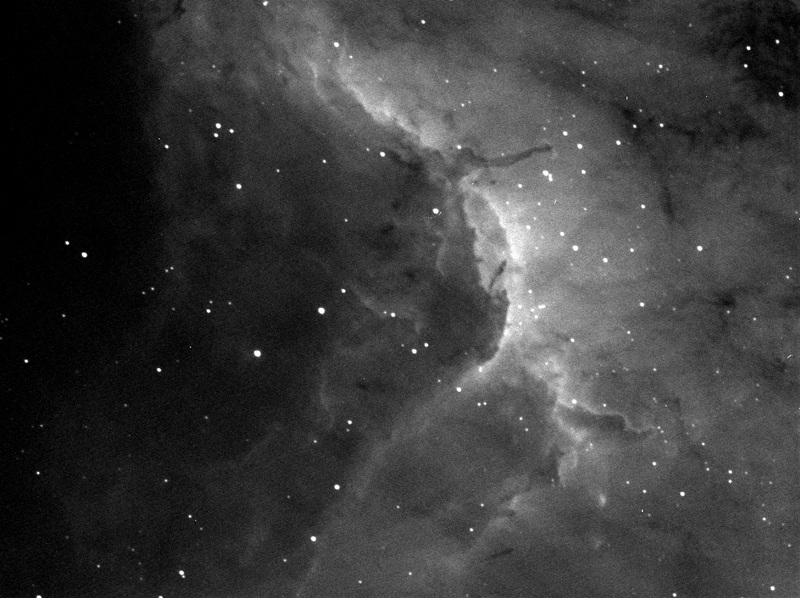 The Pelican Nebula region looked in the right place, and is one of the brightest things up there. Since I have a better behaving amount, I decided to give PHD guiding a go. I’d tried this before, but never had much luck making it work with my old LXD55. Happily it worked very well with the new mount. I've heard many good things about PHD, and I was confident it would work once I had a mount which worked in a predictable manner. Of course, with a new bit of Autoguiding software there are lots of buttons to press and numbers to tweak. Much time was wasted doing this (which of course utterly defeats the point of PHD guiding, but that is my fault!!) and finally I ran a single 30 minute sub frame before collapsing into bed. Anyhow, there is the final result. Totally uncalibrated and unprocessed, except for a bit of a stretch. Astrodon 6nm Ha filter. There are several faults with this image, but the one we are most concerned with is the DEC guiding. The stars are slightly egged in DEC and unacceptable. The strong wind didn't help, but I'm going to have to do some tweaking to reduce the slack in the dec drive train. On a brighter note, I've never done a 30 minute sub frame before!